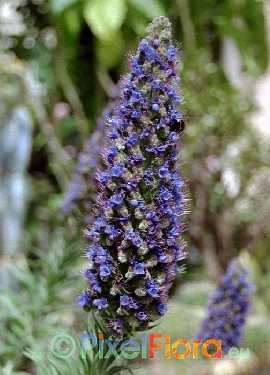 At present some 30 Macaronesian Echium species (Giant Bugloss) are known. Out of these, 25 endemic species plus some varieties occur only on the Canary Islands, 2 species can only be found on Madeira and neighboring island of Porto Santo, and 3 species are endemic to the Cap Verde islands. 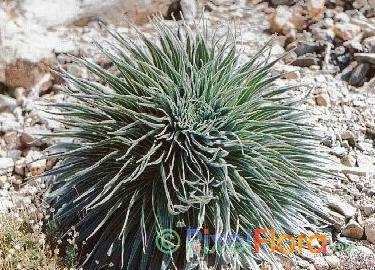 The Canary islands host by far the largest number of Echium species apart from the genera Aeonium (Giant House Leek), Argyranthemum (Canary Marguerite) and Sonchus (Giant Thowthistle), which is due to both to the size of the archipelago and the topography (altitudinal range) with numerous habitats (semi-desert, dry shrub, evergreen and semi-moist laurel forests, dry pine woods, and semi-dry subalpine regions). 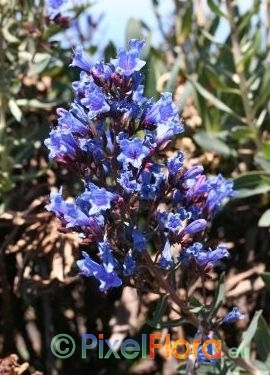 It is believed that the development of Echium species native of the Macaronesian islands (the Azores, the Canary Islands, Madeira and the Cape Verde) shortly commenced after the first islands had raised from the Atlantic ocean, which was for example some 19 million years ago in the case of Fuerteventura and Lanzarote. In that prehistoric time all Macaronesian islands, as well as the whole Mediterranean region (then called the Thetys region) had been located in a tropical and humid zone. In the course of several millions of years the climate has changed dramatically and left the Mediterranean as a zone with winter rains and summer droughts and the extension of the Sahara desert towards North Africa. Concerning recent scientific research, evolution of the genus Echium took mostly place by adaptive radiation and vicariation. The model of adaptive radiation describes that in a single population some genetic mutations occur now and then by happenchance. As a result some of these naturally induced mutations may be better fitted to grow in certain niches than their parents. The best example for this evolutionary process are the 25 taxa within the genus Echium native of the Canary Islands, probably descending from a single prototype Echium, which is supposed to have been close to Echium decaisnei ssp. decaisnei (Gran Canaria), originating in the southern Mediterranean. 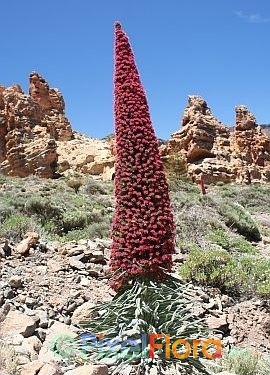 Whereas this parental species had become extinct due to the formation of the Sahara, this first prototype Echium successfully conquered several niches on the islands in a process of adaptive radiation, for example Echium gentianoides (La Palma) and Echium wildpretii ssp. wildpretii (Tenerife) in the subalpine zone, Echium pininana (La Palma) in open spots in the laurel forest, Echium callithyrsum(Gran Canaria),Echium webbii (La Palma) and Echium sventenii(Tenerife) in the dry pine forest, Echium simplex (Tenerife) in the upper succulent shrub, and Echium handiense (Fuerteventura), Echium onosmifolium ssp. onosmifolium and Echium onosmifolium ssp. spectabile(Gran Canaria) and Echium vulcanorum (Cap Verde) in the lower succulent shrub. A subsequent or parallel step of evolution is described by the model of vicariation. A single species may split up into two or more new species by discjunct separation of a single population on grounds of for example volcanic eruptions or incidental distribution by birds on two islands. In the beginning the two populations grow under more or less the same conditions (in what concerns soil, moisture, altitude, exposure to sun radiation, etc. ), yet the gene-exchange between them is interrupted more or less completely and hence populations start to develop in different ways leading to new, separate species. This process may have taken place for example in the closely related Echium aculeatum, Echium leucophaeum, and Echium brevirame (on Tenerife, respectively on La Palma), and Echium acanthocarpum (La Gomera), Echium candicans (Madeira), Echium hierrense (El Hierro), Echium bethencourtianum and Echium webbii (both La Palma endemics), as well as Echium virescens (Tenerife). All members in these two groups grow in similar habitats, yet on separate islands. The two subspecies of the red Taginaste (Echium wildpretii ssp. 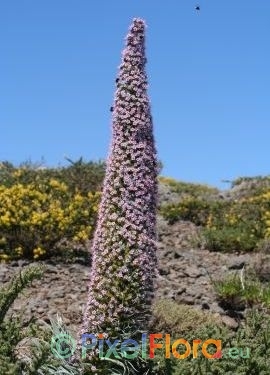 wildpretii) on Tenerife and the Pink Taginaste (Echium wildpretii ssp. trichosiphon) on La Palma are either still at the beginning of the process of vicariation and creation of new species, or the genetic exchange between both subspecies is still too high, so that no two independent species can develop. For example bees and other pollinators can cross the strait between both islands under favorable winds, passing pollen from one subspecies to the other. 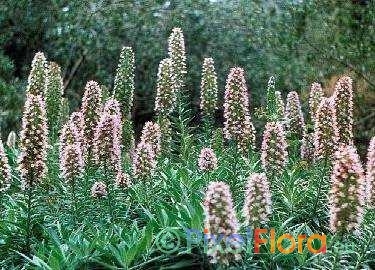 Most Macaronesian Echium species grow as rather large and tall perennial shrubs with woody stems, in contrast to their relatives from the Mediterranean, Central Europe and Asia Minor, which usually are weedy annuals or biennials. This is due to a very stable climate found on these islands throughout the year. Plants develop a remarkably deep running root system, so that they withstand even the driest months during summer dormancy. Most moisture is received from sometimes heavy winter rains. With first rains in autumn in combination with a slightly rising air humidity, new shoots will emerge rapidly, unfolding their beautiful and showy terminal inflorescences from following spring to summer. During the hottest and driest months (from end of May to end of September) tall branching woody species will shed most of their leaves. All subalpine species, i.e. Echium auberianum, Echium gentianoides, Echium wildpretii ssp. wildpretii, Echium wildpretii ssp. trichosiphon, as well as Echium simplex dislike permanent wetness in their root systems. They prefer a soil with very little humus. A good soil is made up of some 10% humus, 30% sand, and 60% crushed lava or pumice for these species . Sow seeds rather flat some 0.5cm deep in some 10cm ø plastic pots. Seeds do not need direct sun in order to germinate properly, however it is recommended to not cover seeds too much. Seeds usually cannot be extracted from the dried fruit capsules without destroying them, thus the entire capsule shall be sowed. Each capsule may contain up to 4 small, nut-like seeds. All Echium species require a significant difference between day and night temperature. Keep pots in a cool spot with direct sun, so that soil heats up to some 20°C to 30°C during the day and cools down to some 5°C to 10°C at night. Germination may be inhibited in several species, if pots are kept at a constantly high temperature (e.g. in a heated propagator or greenhouse). Usually seeds will germinate rapidly within one to two weeks. However certain seeds from the same species may need several months to germinate finally. Thus do not throw away pots with ungerminated seeds, but keep them always slightly moist in a sunny spot.As soon as seedlings appear, keep pots in a sunny spot. Echium pininana endemic in the laurel forests on La Palma prefers a partially shaded spot, as direct sunlight may burn its young leaves in summer. Transplant seedlings to 20cm ø (5 liter) pots as soon as the fifth pair of real leaves has appeared. Carefully unpot plants and try to save as many of the fine roots as possible, as all Echium are easily affected by disturbance of their delicate root system from which they usually need some time to recover. Transplant monocarpic species (Echium pininana, Echium simplex, Echium wildpretii ssp. wildpretii and Echium wildpretii ssp. trichosiphon) to a final pot size of some 10 liters as soon as rosettes have gained some 30cm in diameter. Water older plants regularly from beneath and never let fall dry the soil completely. Plants will usually not recover, once the soil will have become "bone-dry". Add some common all-purpose fertilizer in half the concentration as directed on the package and feed plants once every week from May to end of September. Most Echium species will grow rapidly and may reach up to 50cm in one year. Monocarpic Echium species with a single trunk may need some more time to establish before they will show good growth rates as well. Due to their origin of winter rain fall areas, most Echium species will grow rather moderately during hot summer months, when they may shed most of their leaves for protection from water loss. With cooler nights and a higher overall air humidity in autumn they will restart to grow rapidly. In rainy and cool summers they will keep on growing on a moderate level. 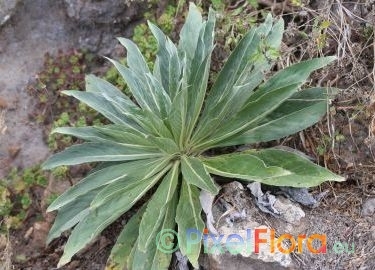 Species from subalpine regions which first make a basal leaf rosette (Echium auberianum,Echium wildpretii ssp. wildpretii, and Echium wildpretii ssp. trichosiphon) do not like direct rain on their leaves, so that they should be protected from too much humidity in wet summers. In case the Echium species are grown in containers, they have to be kept under frost-free conditions in winter (from October through end of April) at a temperature minimum of some 10°C in a sunny spot. Reduce watering in winter months, unless plants are grown under heated glass throughout the year, when they will require more moisture and will grow faster. All four subalpine members (Echium auberianum and Echium wildpretii ssp. wildpretii from the Las Cañadas crater depression and surrounding mountains of Tenerife, as well as Echium gentianoides and Echium wildpretii ssp. trichosiphon from the surrounding mountain ridge of Caldera de Taburiente on La Palma) are exposed to freezing down to -10°C or even less at night in winter. However temperatures rise significantly above +10°C or more at daytime in their habitat. These species are semi frost resistant and may be worth a try to be grown outside in the open garden in a sunny spot in climatic favorable regions on Central Europe. They will need some good protection from winter rains, as their hairy rosettes are easily prone to rotting from permanent moisture in winter. Alternatively, these make some excellent plants for an unheated greenhouse or cold glass in Central Europe where moisture can be controlled easily. In milder climatic areas of Europe, where freezing is not very likely to occur in winter (such as the northern Mediterranean coastal areas, the eastern Atlantic coast and the south-western parts of the UK), most Echium suit a permanent cultivation in the open garden in a sunny spot in any well drained soil with some protection from cold winds (e.g. on the bottom of a south-facing wall). Most Echium will start to flower within 2 to 4 years. Monocarpic species (Echium pininana, Echium simplex, Echium wildpretii ssp. wildpretii, and Echium wildpretii ssp. trichosiphon) will slowly die down after flowering, usually producing seeds in abundance for the next generation. All branching a and woody perennial Echium species (e.g. Echium acanthocarpum, Echium callithyrsum, Echium candicans, Echium giganteum, Echium hierrense, Echium nervosum and Echium webbii) may be cut back to some extent directly after flowering from late spring to early summer. New branches will emerge, making a beautiful set of inflorescences the following year. 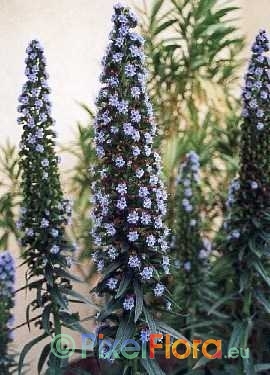 In general all Macaronesian Echium are very pest and disease resistant pot and container plants. However especially during winter months, several biting insects may sometimes occur in abundance on young leaves and weaker shoots. These unwanted insects are easily controlled with any commercially available insecticide (be it as a spray, a powder or a liquid solution) in concentrations as directed. Besides that, leaves may get infected by fungal diseases as a result of lack of light and excessive air moisture in winter. However, these parts will rapidly be outgrown with a higher light intensity and longer and warmer days in spring and early summer.